While you go on a fun-filled vacation, your dog can too! When coming to a sleep over at Cubby’s, your dog will play all day and get some much needed rest in our canine condos at night.Boarding is available exclusively for active daycare clients. Reservations are required in advance. 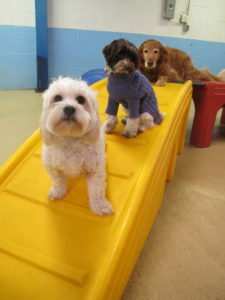 All dogs must be active daycare clients to board with Cubby’s. 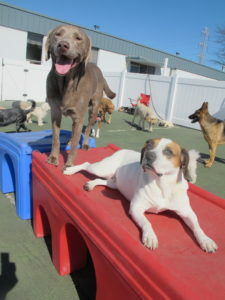 Dogs must pass a behavioral evaluation and attend at least four to five days of daycare prior to their first boarding stay. Dogs must attend daycare at least once per month to remain active. Please bring dry food individually bagged per meal. Cans and wet food can be brought as packaged. Please provide written feeding instructions (example: one bag, two times per day). We provide bowls for mealtime so bringing bowls from home is not necessary. We will gladly give medications provided there are written instructions. Boarding Rate: $40 per night and includes participation in daycare. Dogs picked up prior to 12:00 noon are charged only the boarding fees. Dogs picked up after 12:00 noon will be charged a daycare fee for the last day. Boarding pick up and drop-off is available anytime Monday through Friday between 6:45 AM and 7:00 PM. Pick up and drop off on Saturday is from 8:00 AM to 6:00 PM and Sunday from 9:00 AM to Noon.